That’s not my observation, nor the invention of the Marketing Department at Diageo , Lagavulin’s owner, but the judgement of the first ever whisky journalist, Alfred Bernard, on Lagavulin’s 8-year-old single malt when he visited Islay in 1887. 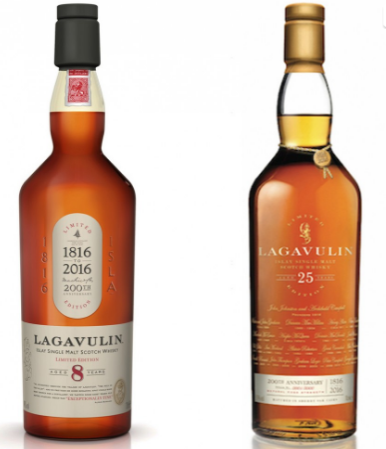 Nobody’s quite sure when production started at Lagavulin but it was certainly going on by 1816 so when the marketing people at Diageo, ever on the lookout for a promotional opportunity, decided to release a 200th-anniversary limited edition, they decided to resurrect the Bernard story and make the whisky an eight-year-old. And, not to miss out on the highly lucrative bling! end of the market, added a 25-year-old. Pricing: 8-year-old is $65 and the 25 $1,200. Not as medicinal as its neighbor Laphroaig, nor as hugely peated as its other neighbor, Ardbeg, the regular release 16-year-old is quintessential Lagavulin sweetness followed by a long-lived bonfire smokiness on the finish. However, these two special releases are very different. What The Hell Is Cigar Fashion?